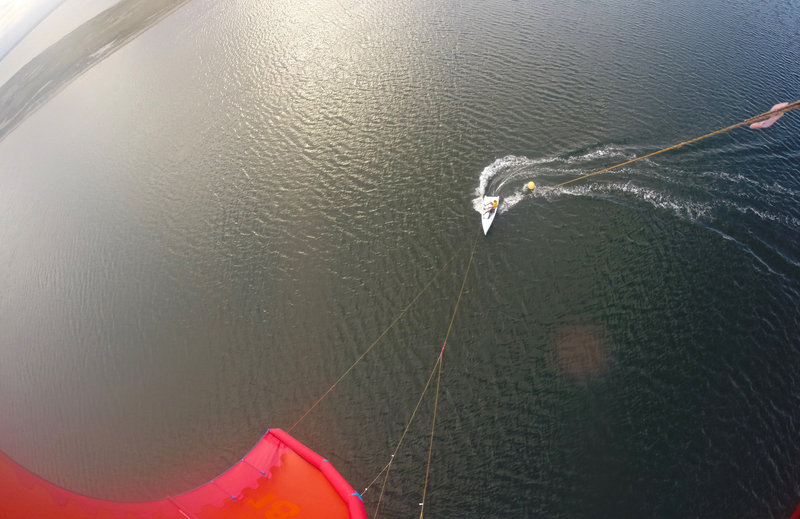 Shannon Falcone took the Kitetender 400 over to Sweden, being unlucky to have NO wind. Segeln mit Lenkrachen auf Booten. Erster Test mit TeamGaebler auf der Kieler Förde. Viel Spass, Adrenalin und Emotionen. Das waren die spontanen Reaktionen bei der Deutschland Premiere und dem Test des neuen KiteTenders zur Kieler Woche. Die Idee ist nicht neu. Doch es mal mit einem wirklich ausgereiften und Serien-Boot zu präsentieren ist ein großer Schritt nach vorne für einen neuen und spektakulären Actionsport. TeamGaebler ist immer offen für Innovationen und hatte die Chance es auf der Kieler Woche zu präsentieren. Jeder der mal einen modernen profilierten Lenkdrachen auf dem Wasser oder an Land in der Hand gehabt hat, kann dieses fliegende Segel nicht mehr los lassen. Es ist einfach Spaß pur mit dem Wind und einem Lenkdrachen zu spielen. Die Kite-Surfer zeigen es schon lange vor, was man damit alles mit anstellen kann (Freestyle, Wave, Speed, Race u.a.). Wir fahren seit rund 15 Jahren mit dem Kite-Buggy an den Stränden der Nordsee- und Atlantik Küste. So lag es nahe, dass wir es auch auf dem Wasser ausprobieren müssen. Jetzt hatten wir die Chance auf der Kieler Förde. Es hat 30min Training gereicht und wir flogen über das Wasser. Mit dem KiteTender ist wirklich ein schlüssiges Konzept gekommen. Daraus wird sicher eine neue Trendsportart entstehen sowie auch Fun- und Race Events. Der KiteTender bringt das Segeln mit Lenkdrachen auf Booten in einer professionellen Weise zusammen. Es ist relativ leicht zu erlernen. Die Idee es zu zweit an Bord zu erleben ist auch sehr interessant. Der Kite Lehrer kann bei den ersten Versuchen direkt an Bord mitfahren. Es ist praktisch ein 1:1 Coaching möglich. Schneller kann man das Kiten auf dem Wasser nicht lernen. Let´s have some Fun! So ein KiteTender kostet rund 6.000€ Wer hat´s erfunden? Die fliegenden Holländer Peter Renssen. Ein einfacher Foiler für Lenkdrachen ist auch schon in Planung. Dazu werden in den nächsten Wochen erste Design Ideen vorgestellt. Lenkdrachen mit ultraschnellen Booten und Foilern. 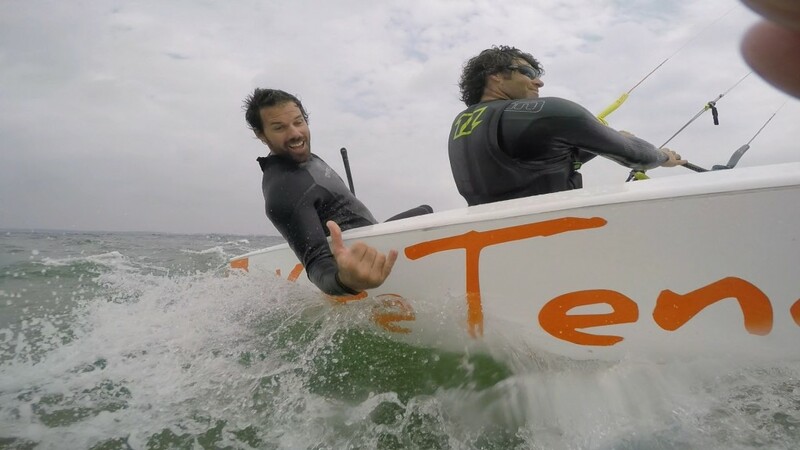 Ein neuer Action- und Funport ist auf dem Wege die Segelwelt zu erobern…..
Below an article by Tom Court, professional kiteboarder, North Kiteboarding, I´ve had over 10 sessions with Tom. It is a rare opportunity to truly innovate these days. Most accessible ideas have been achieved and a little like the levels of a computer game, it gets harder and harder as time goes forward, which brings me to Kite Tender. Kite Tender is a project that was brought to my attention last year when a ‘certain kind of crazy’ Dutch man arrived at my house with what looked like a glorified Laser One boat strapped to the roof of his Mercedes. Peter Renssen – as he introduced himself – and his Kite powered boat, the world’s first commercially available! Now I’m not saying that kite sailing hasn’t been done before, quite the opposite. The Chinese were using Kites back in the 13th Century for propulsion, and in 1903 aviation pioneer Samuel Cody succeeded in crossing the English Channel in a small collapsible canvas boat powered by a kite. In addition to this, large container ships have used them as fuel saving options and rescue to guard against engine failure. However the idea has never been taken to the next level and made available to everyone. But why not? I’m not going to lie, my initial reaction was that of extreme skepticism. As a kiteboarder and a sailor myself, I have never seen the desperate need or indeed the potential benefits of combining the two. Kiteboarding has always been kiteboarding and sailing, well sailing, different worlds, lifestyles and very different psychologies. So what had got Peter, a 50 year old sailor, so excited about this project? I admit I was intrigued. Over the course of a week on the Isle of Wight during the peak yachting season, we proceed to test Kite Tender to its limits. Taking an unapologetic approach, we launched it at a few well known dinghy sailing spots, lifting the hull off the car roof and leaving it on the beach whilst we rigged the kite – a standard kitesurfing setup albeit a 17m Dyno – our aim was to spark interest, get real opinions from both pure sailors and dedicated kiteboarder’s alike, find out what people really thought. Upon first contact my immediate skepticism faded slightly. 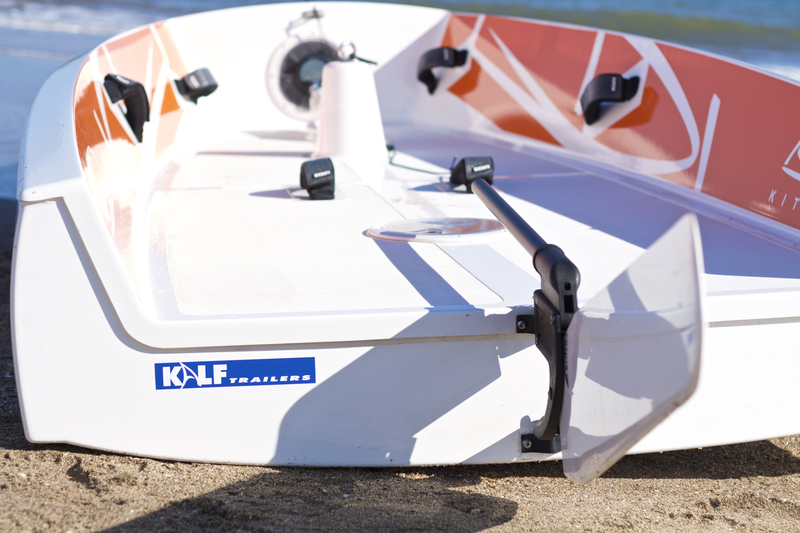 The launch and practicality issues that had immediately sprung to mind didn’t seem to be such an issue, with the right spot to use a Kite Tender, it is surprisingly user friendly and straightforward. Clipping the kite into the boat at the edge of the water so the pilot bears none of the load, and launching the kite exactly as you would as a normal kitesurfer the process was simple. As the Kite Tender 400 is designed for two people, it’s ideal to hit the water with a friend – which also helps when it comes down to launching the kite. Pushing the boat from the beach into the water and pointing the nose across the wind, lowering the rudder with one flick of the wrist, and sliding the dagger board down once we got into deep enough water (80cm) we were off! Starting slowly and heading away from the beach, it felt good; natural and easy we reached across wind, a feeling that replicated that of a sailing boat, but without the obvious pitch caused by a standard mast, or other associated heeling motions from a standard sailboat. With the hull sitting flat in the water without much effort, the speed increase was instantaneous. From zero to twelve knots in just a few seconds, the power generated from the down turn of the kite, popped the boat onto the plane and away we went. After a few warm up gybes and tacks, we were ready for some speed! Turning the kite more aggressively, lowering it towards the water and bearing away slightly down wind, the boat really started to shift. The onboard GPS and speed meter measured average speeds of 16, 17, 18 and 20 knots, and it continued to rise. It was fairly easy to hold the speed once you were going, any lulls in the wind could be bridged by moving the kite to generate power, something that would be impossible to do in a sail powered dinghy. 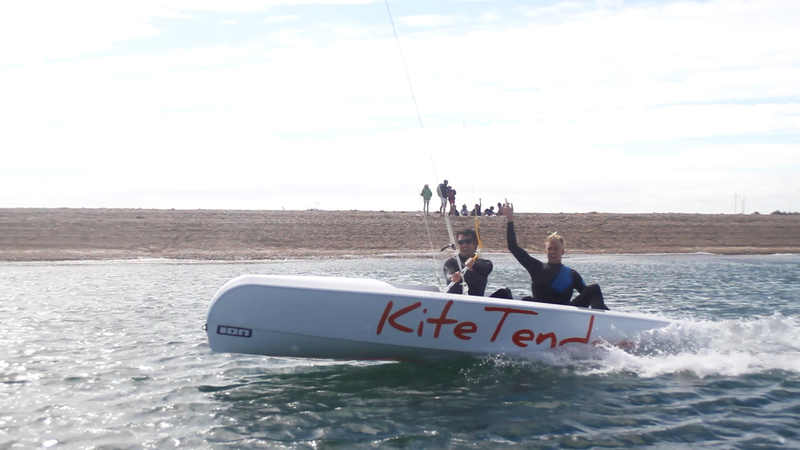 Having learned the ropes and got a feel for the Kite Tender, the next test was to pitch ourselves against a racing boat. As we were taking to the Solent during the world renowned and prestigious Cowes Week, we had the opportunity to playfully compete against a wide range of sailboats. It was possible to outperform most other boats on the water once your teamwork had been dialed, in fact, one of the most interesting aspects of the Kite Tender for me was this teamwork element. It is unlike any other kite sport that I have tried. When you’re navigating the Kite Tender with someone else, the outcome is entirely dependent on each individuals skills, along with that of general teamwork. The person flying the kite has to work with the helm to get timings right, and the helm has to instruct or predict the lifts and pulls of the kite in order to get the most out of those surges of instant power that it is possible to generate with the kite. Successful tacking and gybing is reliant on this dynamic, especially when one can kill boat speed immediately around a mark, or unbalance the hull if the kite ends up on the wrong side of the boat. Overall it was an exciting experience, fast and easy to control but more importantly, it was possible to share that experience with the other person in the boat. 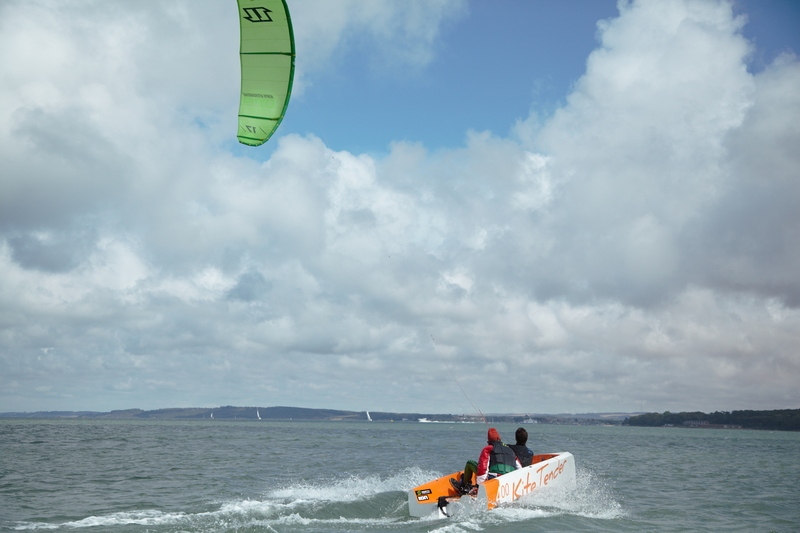 For the first time ever the skill sets of a sailor and a kiteboarder could be combined into one exhilarating experience. For me, this was an unexpected pleasure that could definitely help to bridge the gap between these two industries in the future. A few weeks ago we did our second project in the south of France, this time with two boats and more people to try, test and race with each other. Once again the objective was to gather as much feedback from other users and see how they thought this unique sport could be used as a tool for progression. 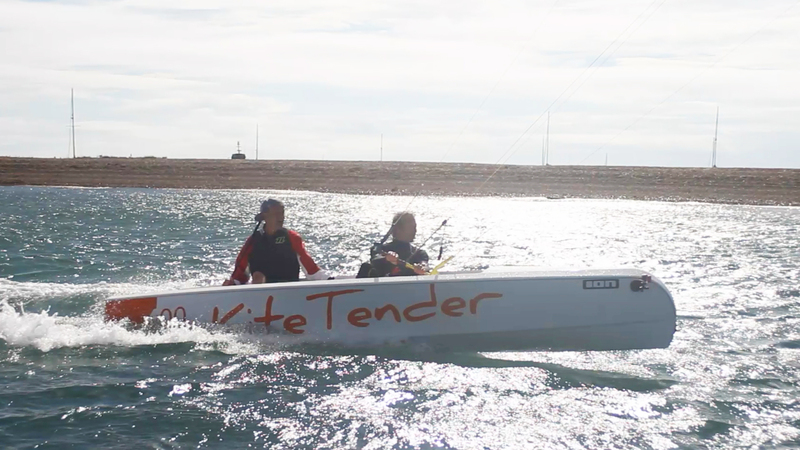 In my eyes, the real value of Kite Tender isn’t just the invention of a new class of sailing that is open to everyone; it can bridge the communication gaps which is invaluable. Used as a training tool for sailors that want to learn to kite, kiters that want to learn to sail, children that are too young to go kiting on their own, disabled people that haven’t previously been able to get on the water; the applications are outstanding and as broad as your imagination. For instance, a father that wants to kite with his young son can take him out on the water without worry of incident, an instructor can teach a student to fly a kite sitting next to them in the boat, or team building can be exercised whilst racing a Kite Tender. In short, it’s a truly exciting prospect across a whole platform of applications.